Coach Operator Positions available with starting at $16.80 an hour. No bus driving experience required. Paid training and great benefits available. Coach Operator: under minimal supervision, safely operate a motor bus around Orange County, highly focusing on customer service, safety, courtesy, and reliability. Qualifications: Be 21 years of age at time of application, have a valid Commercial Driver's License (Class C) and have had it for a minimum of 3 years, one year of public contact or bus driving experience. A current DMV H6 printout is required at the time of application submission. 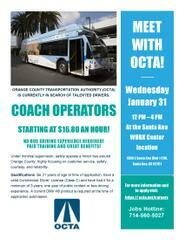 For more information and apply visit: https://octa.net/careers or call the Jobs Hotline at (714) 560-5027.